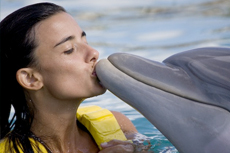 Cozumel's dolphin programs bring cruisers up close and personal with the affectionate creatures. Enjoy interacting with the dolphins as you become one with their habitat. It was so fun! They took you to Chankanaab by taxi, then they taught you some stuff, then they took you to swim, ride, and do tricks with the dolphins! You could also scuba dive and go to the beautiful beach. Fun place and buffet and drinks are included. This was a once in a lifetime experience to get up close and personal with a dolphin. Absolutely loved our day at Chankanaab. was hoping to spend more time with the dolphins. was hoping to spend more time with the dolphins. lunch wasn&apos;t great, but the drinks offset that. kids enjoyed the pool after the dolphins. pictures were way overpriced, but glad I got them. Worth the money; excellent excursion. Harmony of the Seas booked this for us, they told us it would be a full experience. Dolphin experience was a lot of fun. Did Royal Swim at the Dolphin Discovery center. Fun with dolphins. Not enough time for snorkeling. Felt like a tourist trap because of price of pictures to buy. Loved, loved, loved this excursion. Loved, loved, loved this excursion. Food and drinks were included in the price. The swim was out of this world. It’s a must do. The dolphins were awesome. The staff was very knowledgeable. The location was beautiful, a great place for the dolphins. The location was beautiful, a great place for the dolphins. The lunch and open bar was delicious and fun; great people. My sister and brother-in-law took our two teenage children on the dolphin push pull excursion. My sister and brother-in-law took our two teenage children on the dolphin push pull excursion. Our children loved this adventure. Fun, would recommend. Did not get to kayak due to rough seas, but everything else really nice. Be warned that pictures are expensive. My family and I loved this adventure, unlimited dining and drinks. My family and I loved this adventure, unlimited dining and drinks. The food is okay, but the drinks were AMAZING! Was so much fun but they don&apos;t allow you to take your own pics and try to sell you pics that are outrageous in cost. The best offer they offered me after I walked away was $130 for 6 pics. No thank you. An Amazing Experience for my Grandmother! Dolphin Swim and Lunch Included was a fun experience. Dolphin Swim and Lunch Included was a fun experience. Food was o.k. Hot Dogs and Hamburgers were a bit odd tasting, but, fajita meat, chips, and sides were great! Poor dolphins in such small pools. Poor dolphins in such small pools. Not a lot of history or facts shared about them during the encounter. You weren’t allowed to use your phones, and pictures were $40 each!!!! Robbery! We thought this excursion was excellent!